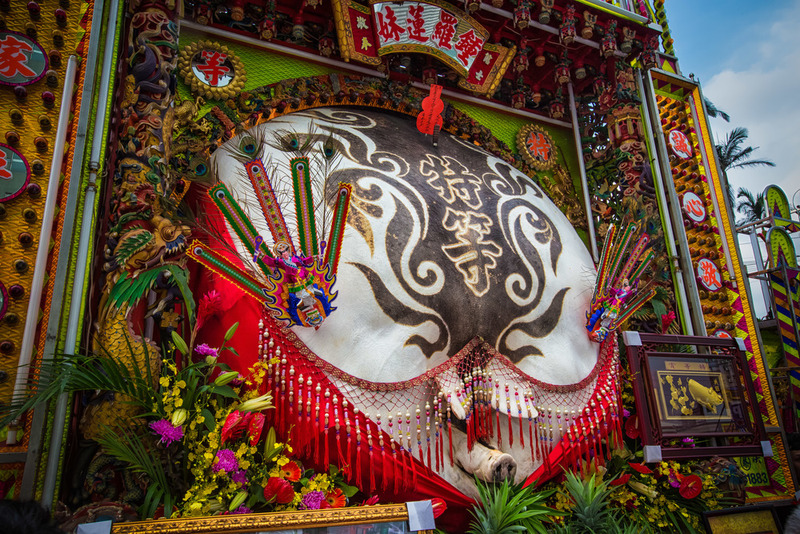 Ghost Month (鬼月 or 中元節) is a month long festival that takes place in Taiwan during the lunar month of July (August on the western calendar) and is probably the most confusing times of the year for expats and tourists in the country. 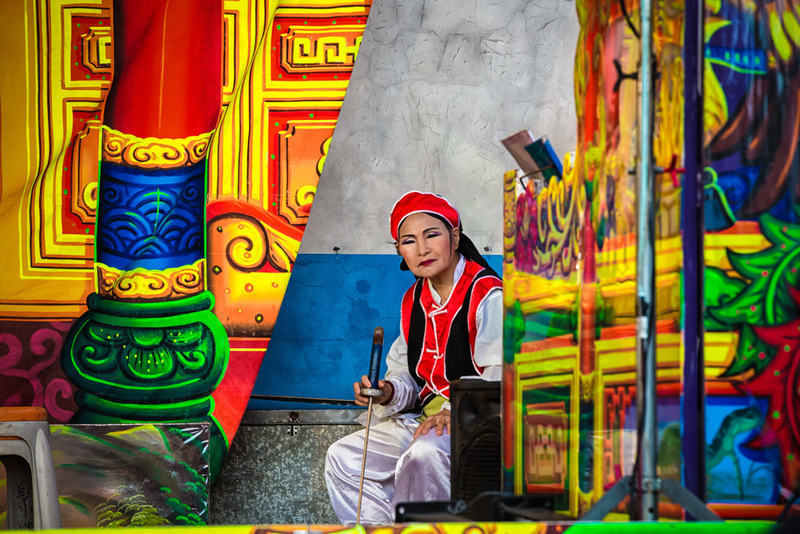 Ghost Month is a festival steeped in ancient tradition, culture and religion and even understanding the basics of the holiday can be a bit difficult for the average person living here. 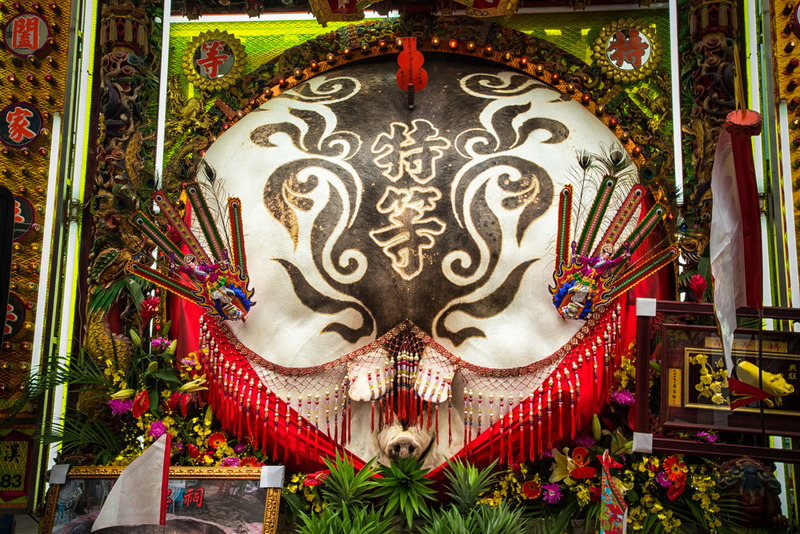 The festival starts on the fifteenth day of the seventh month on the lunar calendar. 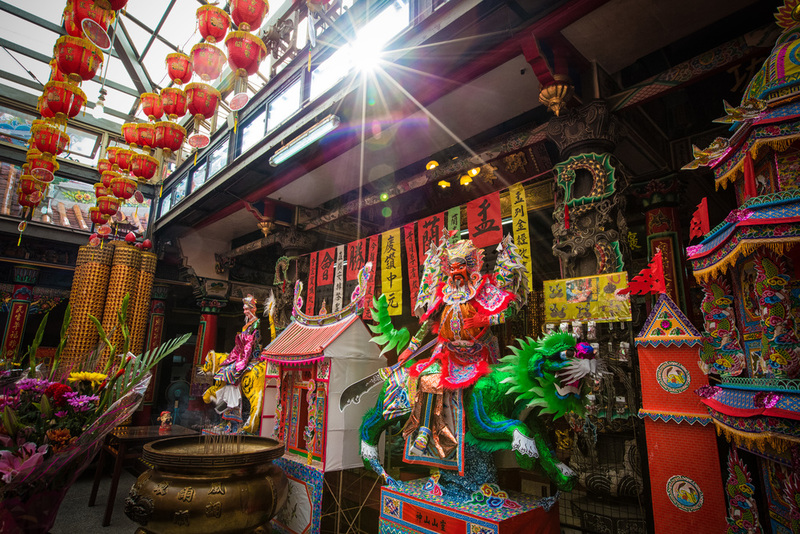 It opens with the ritual opening of the ‘ghost gate’ or the 'gates of hell' (鬼門) at the Laoda temple (老大公廟) in the port city of Keelung. When the gate opens, ghosts escape and wander freely around the country for the month. During this period of time it is superstitious for people in Taiwan to wander around alone at night, go swimming, get married, move to a new house, open a business, hang laundry outside, wear red (ghosts like red), sing songs or whistle, etc. etc. etc. It is important that people do their best not to disturb the (easily irritated) ‘hungry ghosts’ which are wandering around the country. Instead families should prepare offerings of food, alcohol and of course burn ghost money so that the ghosts have their fill and get enough money to live comfortably in the underworld. During Ghost Month there are different rituals held on specific days, but what I'm going to focus on today is a specific ritual practiced by the Hakka (客家) people in Taiwan called the Pigs of God Festival (中元普渡殺豬公). 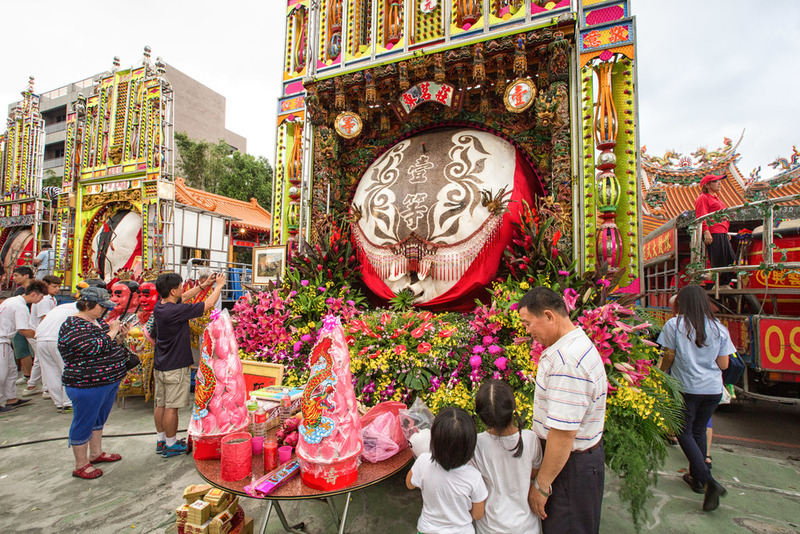 There are various festivals with Pigs of God held throughout the year in Taiwan and even though they're all somewhat similar, the one I'm talking about today is the one held during Ghost Month. So what is the Pigs of God festival? 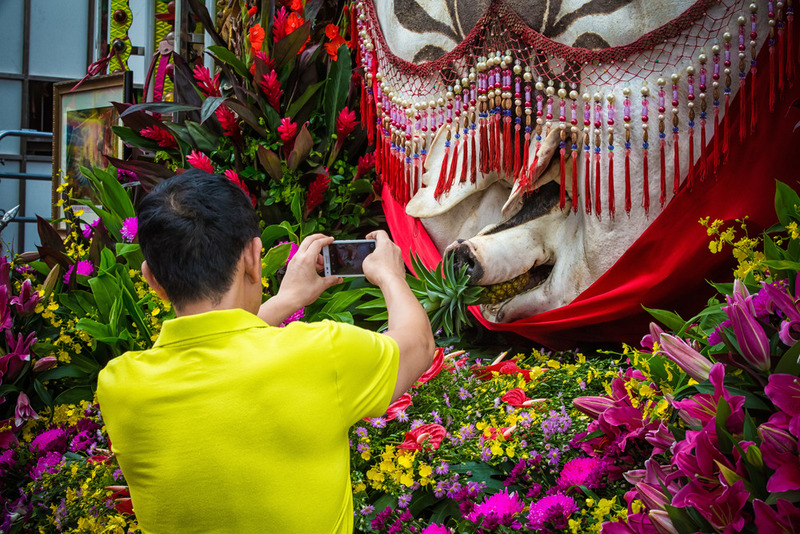 To put it briefly, it is a cultural and religious event in Taiwan that involves animal sacrifice and growing a pig to a size of extremely unhealthy proportions in order to offer it to the gods and of course, during Ghost Month, to the ghosts wandering around Taiwan. Bringing the Pigs of God into the Temple grounds. 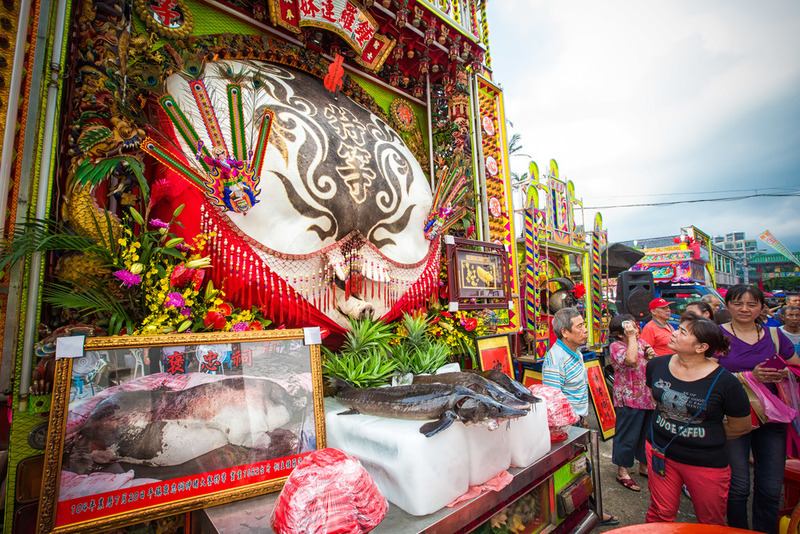 This Pigs of God festival has become a controversial one over the past few years with many arguing that Taiwan has become a modern country and this sort of practice should not continue while others argue that it is a traditional aspect of Hakka culture and therefore it should be preserved. The pigs in question are raised on farms and contests are held throughout the year to see who can raise the largest. The winner this year was 1682 "Taiwangrams" (台斤) which (if my calculations are correct) is 1009 kilograms. (Taiwangrams is a crappy translation). I'm not sure how large a typical pig grows, but I'm sure it's not anywhere close to that size. The pigs are raised in a way that they are constantly overfed which ultimately makes them immobile and forces them to just lay there in their room until the time comes for them to be sacrificed. This lifestyle is extremely unhealthy for the animals as they develop painful bed sores and often suffer from organ failure. A Taiwanese woman checking out the "winning" pig. This festival still attracts crowds of people each year, but it has started to lose its appeal in larger cities and animal rights activists consistently point out the unnecessary suffering that it causes these animals. Coincidentally this sort of activity is actually illegal in Taiwan yet the government fails to enforce laws when it comes to this kind of thing as they are afraid of the backlash they'd receive. Evidence of this inaction is that the festival was used by local politicians (looking to be elected in the elections in January 2016) to get out and mingle with common folk and to take part in these carnival-style temple festivals. While walking around I saw several legislators and politicians from all the major parties making the rounds and showing their reluctance to actually make a positive change. This year I attended the Pigs of God sacrifice ritual at the local Yimin Temple (義民廟), a popular multi-religious Hakka temple in Ping Chen City (平鎮市) I arrived earlier than the Pig Gods (they're not slaughtered in public any longer) and had a chance to shoot some of the preparations and talk to the temple chief who seemed more like a successful politician than a religious leader. When the Pigs of God arrived there was a lot of fanfare including taiko drummers, fire crackers and traditional Chinese music being played on deafening horns. The Pigs of God arrived in vehicles that were retrofitted in an ostentatious religious fashion that would be ‘appropriate’ for transporting the animal sacrifices or a disco party. Typically at least three Pigs of God are brought to the temple after being paraded around the city and they represent the first (特等), second (壹等) and third prize in terms of weight. The largest pig is placed in the middle and gets the most attention from onlookers while the other two are on either side. The pigs are shaved and their skin is painted white and black; The dagger used to kill the pig is jammed into its back and pineapples are placed in their mouths as their skin is spread out and put on display with ribbons and flowers draped around it. It is believed that the fatter the pig the more blessings people will receive from the gods so over the last few decades people have come up with more ‘efficient’ and essentially cruel ways to submit the largest pig possible to the gods. During Ghost Month the pigs are put on display and their meat is offered to the ghosts as a sacrifice. When the ghosts have had their fill, the meat is butchered on site and passed out to the people who took part in the event. As if sacrificing the The Pigs of God wasn't enough, other animals have the unfortunate luck to be sacrificed to the gods as well. This year there were a stuffed ostrich and several skinned goats (wearing sunglasses and smoking cigarettes) which were brought in to accompany the pigs. While speaking with the temple chief I mentioned that it was the first time I had seen an ostrich at the festival. He laughed and said every year is different and sometimes they even have crocodiles. He went on telling a long story about the importance of each animal in mixed Mandarin and Hakka (forgetting that I was a foreigner) and I just smiled and nodded. I didn't stick around for the whole night this time around, but just to explain some of the entertainment that was going on around the festival, there was a Taiwanese opera troupe performing off to the side, there was a stage set up for later in the evening where middle-aged ladies dressed in skimpy clothes would sing and dance, a Three Prince (三太子) dance and a night market was set up selling traditional night market fare on the street next to the temple. The entire festival has a carnival-like atmosphere and for most people, I'm sure it is easy to forget that there are massive dead pigs on display. The whole thing is a bit surreal and even though there is a lot of strange and almost unbelievable things happening, it is still a rather interesting event to take in while visiting Taiwan. I would obviously much prefer that the Pigs of God weren't real animals who lived a life of tremendous suffering and cruelty before being slaughtered, but as far as culture goes, I suppose we have to respect it despite our objections. Things are changing in Taiwan and young people are no longer amused by this type of activity. Animal rights activists can take solace in the fact that because of their hard work certain aspects of this festival will be either phased out or completely replaced. If you are genuinely interested in experiencing the festival, then by all means attend one and check it out. If you are squeamish or have a dislike for extreme noise pollution, it isn't the best place for you. I haven't included the full set of photos in the gallery below so if you are interested, click the Flickr link to be brought to the high res set off-site. As always, if you have any questions, comments or complaints, don't be shy and comment below!